Taken from the St Paul’s end of the Millennium Bridge and also showing some of the copious bunting put up for London 2012. Part of a mural created to commemorate the London 2012 Olympic regatta held in Weymouth/Portland. An interactive artwork involving loads of bright pink, skeletal looking pieces was part of the Cultural Olympiad on offer at Greenwich during the Olympics and Paralympics. In view of their shape it seems natural that the largest ‘work’ and the unused components nearby resembled a bright pink dinosaur. Part of the 2012 Cultural Olympiad, Illuminate Bath brought some modern day magic to the Georgian streets of Bath last week. I searched in vain for the owner, but sadly there was no sign. I’d like to think it was someone like Sir Chris Hoy passing through. 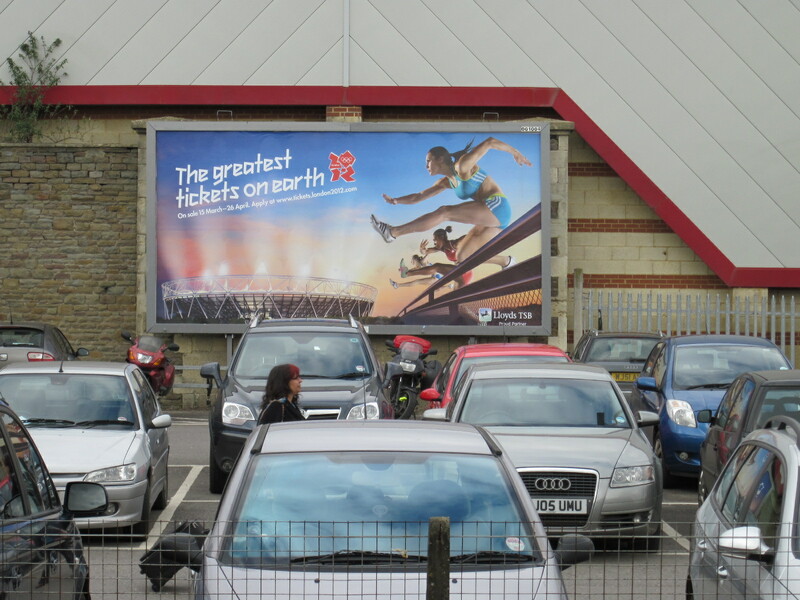 Seeing the car and the posters recently has made me think about the Olympics and what it means to this country. There’s been lots of criticism about how once again London and the south-east stand to gain the most from the event. However, up and down the land there’s thousands of people busting a gut and dreaming about representing GB in our home Olympics. Pretty much every community will have someone with that dream, so we’re all touched by it in some way. My husband even trains with one of them from time to time. Stephanie Millward may spend most of her time training with the rest of the Paralympic swimming hopefuls in Swansea these days, but she still comes home and swims at Corsham pool, where her own dreams started around 15 years ago. Next year she and the rest of the Paralympic team (not just the swimmers) will be based in nearby Bath for their final preparations for the Games. The athlete on the poster is our world champion diver, Tom Daley. I didn’t really set out to contrast the glamour of the Olympics with where the advertisements are actually displayed, but I’m rather pleased I’ve found these over the past couple of weeks and will be looking out for more. This one’s even more ironic as Bath University is where many of our top athletes train, including Amy Williams: our sole Olympic gold medallist from the last winter games. It’ll also be the home camp for the entire GB paralympic team for 2012.